I grew up with the luxury of having homemade gnocchi as often as I wanted. Both my grandmother and mother made them, and we had countless Italian markets in our town that made them fresh. But as an adult I found I rarely made them… until my daughters discovered how delicious and satisfying they were. Now, I make them almost weekly, and the girls enjoy them as an afternoon snack with a simple sauce of butter and basil, or as a main course with vodka sauce. 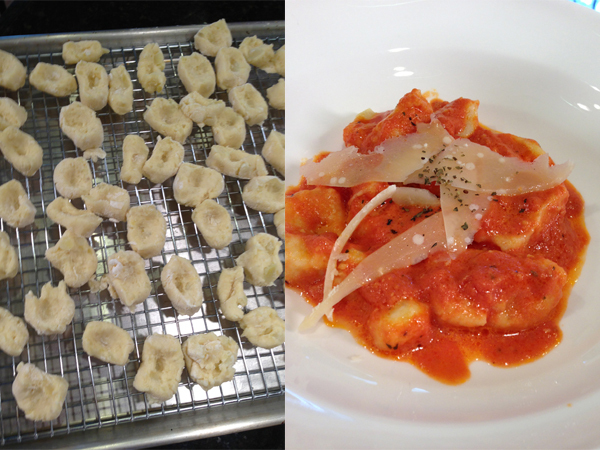 I have worked on perfecting the light and fluffy gnocchi for months. And now, I believe I have it down. Traditionally, gnocchi are made with russet potatoes. I have incorporated Yukon Gold into my recipe, as they add a delicious buttery flavor to the dough. And to lighten the texture, I add just a bit of mascarpone cheese. Watch the video for a demonstration of how easy these treasures are to make, but know that since I made the video, I have tweaked that recipe a bit and added parmesan cheese to the list of ingredients. The recipe for my gnocchi is below. I hope your family enjoys every bite! Bake the potatoes until tender, remove from oven, let cool slightly and then remove the potato from the skins and place them on a large cookie sheet to cool completely. Try your best to keep the potatoes fluffy…do not press down on them. The fluffier the potato, the lighter the gnocchi will be. Transfer the potatoes to your work surface that has been lightly floured (about ¼ cup spread out) and make a well in the center. Put the eggs and salt in the well, along with two cups of the flour and begin to mix. Once the mixture starts to come together, quickly add one more cup of the flour, the mascarpone cheese and grated cheese and mix together. This whole process should take no longer than 5-6 minutes. Separate the dough into six or seven balls. Working with one ball of dough at a time, roll the dough on the work surface (be sure it is dusted with flour to prevent sticking) until it becomes a long rod. Using a knife cut the dough into half inch pieces, and role your thumb on each piece to make a slight indentation. Let the pasta dry slightly on the flour dusted work surface while you boil the water. Bring six quarts of water to a rolling boil and add two teaspoons of salt. Add the gnocchi, and cook for 2-3 minutes. When the gnocchi float to the top, they are just about done. Leave them there for 30 seconds more so they puff up a bit. Drain the gnocchi with a slotted spoon and place them directly into the sauce of your choice (Do not drain the gnocchi into a colander or they will fall apart). Finish with a little parmesan cheese. The Elegant Occasion Note: If you are freezing the pasta, place the gnocchi on a parchment lined baking sheet in a single layer. Cover the baking sheet with plastic wrap and freeze for a few hours. Once the pasta is frozen, transfer the gnocchi to freezer bags and freeze for up to 30 days. The pasta can be put into the boiling water directly from the freezer. The Elegant Occasion Note: For planning purposes, the average person would eat 8 gnocchi as an appetizer and 16 as a main course, as these are very filling. I make a different dessert just about every day so I am always trying to come up with new and interesting things that my family will enjoy. 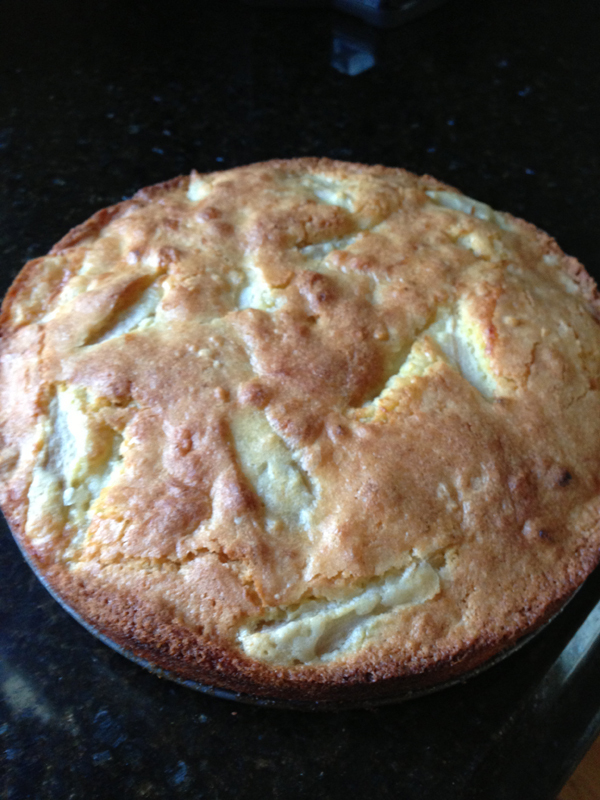 This pear cake is a winner! Not only is it moist and flavorful, but it is so simple to make, you don’t even have to take out your electric mixer. This is one of those cakes where the batter rises up around the fruit while cooking, And the texture is a cross between a cake and a very light pancake. You can vary this recipe with any fruit/flavoring you like. For instance , in the summer, peaches and blueberries are great with the cognac. Don’t want the alcohol, don’t add it…it is wonderful either way. Grease an 8-inch springform pan, and place on a parchment lined baking sheet (to prevent batter from dripping on pan). Peel the pears, cut them in half and remove the cores, then cut into about 2 inch slices. Set aside. In a small bowl, stir the flour, baking powder and salt to combine. In a large bowl whisk the eggs, sugar and vanilla. Beginning and ending with the flour mixture, alternate adding the flour and the melted butter until combined. Be sure to whisk after each addition. Fold the pears into the batter until they are completely coated. Pour the entire batter into the springform pan and bake in a 325 degree oven for 45 minutes to one hour. You know the cake is done when a knife or toothpick inserted into the center of the cake comes out clean. Let the cake cool for 30 minutes and then unmold from the springform pan. The Elegant Occasion Note: This cake is wonderful served warm or at room temperature. Do not cover the top of the cake when storing, as the cake is very moist and will become too soft. Once cut, place a piece of saran wrap on the exposed area that has been cut. This cake will remain delicious for up to three days, if it lasts that long. I am continuing the birthday theme from last week, and wanted to share my recipe for Swiss Meringue Buttercream. Unlike the cloyingly sweet confectionary sugar buttercream frostings that you get in some bakeries or grocery store confections, the Swiss Meringue Buttercream has a rich and luxurious texture that just about melts in your mouth. I use this style buttercream for cookie fillings (French Macrarons) as well. Don’t be afraid of this method, as it is extremely easy. And once you have mastered it, the flavor possibilities are endless! Watch the video to see a demonstration. In a double boiler over a simmering heat, whisk the egg whites and sugar continuously until the sugar melts and the mixture turns silky, and it feels smooth when rubbed between your fingertips (this process takes about five mutes). Pour the egg/sugar mixture into the bowl of an electric mixer fitted with a whisk attachment, With the mixer on low, and gradually increasing it to a high speed, whisk the meringue until stiff peaks form and the mixture becomes glossy(approximately 5-7 minutes). Turn the mixer to a medium setting and add the butter into the meringue (whisking in one stick at a time) until the entire pound of butter has been added. Once the butter has been incorporated mix the frosting on high speed for 60 seconds. It should be creamy and rich. With the mixer on low, add the vanilla and the raspberries and mix again for 30 seconds. The Elegant Occasion Note: Keep the buttercream at room temperature if you are using it the same day. 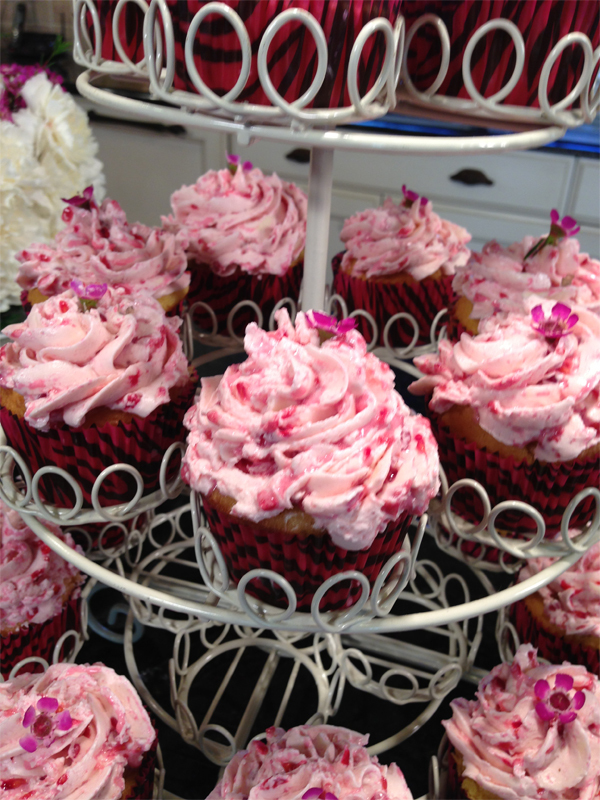 If you have frosting left over, you can store it in a covered container in the refrigerator for up to 48 hours. Remove the buttercream from the refrigerator four hours before you are going to use it, and give it a whisk in the electric mixer one more time to get it back to a fluffy consistency, once it comes down in temperature. The Elegant Occasion Note: If you wish to make a plain vanilla buttercream, omit the raspberries. For a chocolate buttercream, melt 5 ounces of dark chocolate and let it cool for 10 minutes. Add it in to the buttercream at the same time you add the vanilla. I am departing from my usual food blog to tell you about an upcoming event that I am very proud to be a part of. On Saturday, May 4th, The Elegant Occasion, Page Hardware and Appliance Company, The Stone House of Guilford and Perk on Main of Guilford will be teaming up to put on a very special Mother’s Day Celebration, and all proceeds will benefit Columbus House. For those of you who are not familiar, let me tell you a little about Columbus House. Columbus House serves people who are homeless or at risk of becoming homeless. Columbus House has been doing this for over thirty years by providing street outreach programs, emergency shelter, transitional and permanent supportive housing, case management and employment services for homeless adults, families with children, and Veterans in New Haven and Middlesex counties. The event takes place at Page Hardware and Appliance Company in Guilford from 10-a.m. to 2:00 p.m. Sample fabulous breakfast/ brunch food prepared by The Elegant Occasion, The Stone House and Perk on Main. Watch the cooking demonstrations and walk-away with recipes so that you can recreate the dishes for your own Mother’s Day celebration at home. “Take a Chance” on some terrific Mother’s Day Gift items, such as a gift certificate to Kiernan Photography or Vera Wolf , a gift basket from The Elegant Occasion, House ware items from Page Hardware and Appliance Company, and much more. I hope to see you there. Together, we can make a difference! April is birthday month in our house. We not only have extended family members with birthdays in this month, but our oldest daughter was born in April. Needless to say, the whole month is pretty much dedicated to talking about, planning for, and celebrating her special day! So, my beautiful little girl (who is rapidly becoming a big girl) and I made a very sweet cake entirely out of fresh flowers as the centerpiece to her birthday table. Assembling the cake is super simple, and the flowers will last for about a week as long as you sprits them with water once a day. Watch the video above to learn how to create this at home, and I think you will agree that this cake is just too adorable for words! To my wonderful daughter; Happy Birthday, sweetheart! I could not love you more! We have a great grill, but now we don’t eat meat. Any ideas on how to keep it interesting on the grill, without getting too complicated?